Quad/Graphics released a 2016 study entitled Millennials: An Emerging Consumer Powerhouse. One of the key areas of focus was how printed materials are used by today’s “connected” generation of Millennials. This article provides an overview why Millennials are an emerging consumer powerhouse! In last week’s column, I discussed research findings from a recent InfoTrends multi-client study entitled Direct Marketing Production Printing & Value-Added Services: A Strategy for Growth. One of the key messages from this study was that Millennials (individuals born between the early 1980s through about 2000) still use print, but they want it to be concise, personal, and part of an omni-channel experience. The Census Bureau estimates that there are currently 83.1 million Millennials in the United States. These individuals account for more than 25% of the population and outnumber Baby Boomers by 7.7 million. Their spending power surpasses $600 billion and is expected to exceed $1.4 trillion by 2020. One of the key areas of focus in the 2015 Customer Focus Research Study was how printed materials are used by today’s “connected” generation of Millennials. This article provides an overview of how Millennials interact with printed media. The Radicati Group reported that consumers receive an average of 567 promotional e-mails each week. Because Millennials are inundated by digital advertising, they have become largely immune to it. Meanwhile, the USPS Household Diary indicates that the average household receives 19 pieces of direct mail on a weekly basis. While digital advertising is largely ignored, direct mail actually stands out. 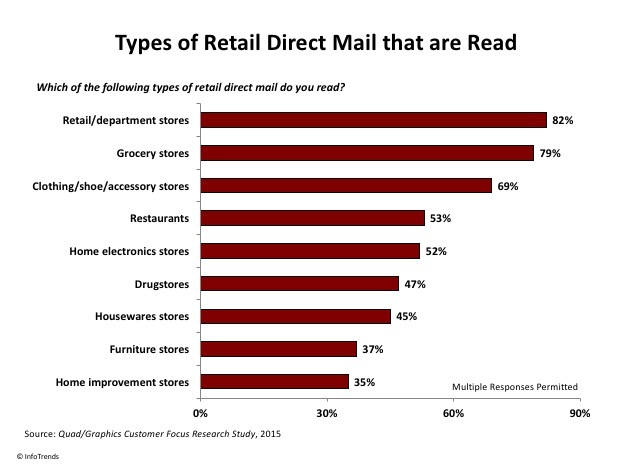 When Millennials were asked about the types of retail direct mail that they read, the most popular types included deliverables from retail/department stores, grocery stores, and clothing/shoe/accessory stores. Although direct mailers get Millennials’ attention, they want to go online to respond to this direct mail. This means that any direct mail pieces that are addressed to Millennials must connect to an appropriate digital channel. The Quad/Graphics study highlighted that 84% of Millennials prefer to respond to a direct mailer by visiting a company’s website. Of these respondents, 53% visit the website using a PC while 31% use their mobile device. According to InfoTrends’ 2015 Multi-Client study entitled Micro to Mega: Trends in Business Communications, survey respondents reported that the average number of media channels used in a typical marketing campaign was three. To effectively reach Millennials with direct mail, print/marketing service providers must deliver an omni-channel experience. According to a survey of 1,000 Americans by advertising firm Valassis and market research firm Ipsos, over 90% of Millennials use coupons to plan their shopping lists. This study also confirmed that more than half of Millennials use coupons the old fashioned way—they prefer to receive their coupons in the mail or via a newspaper/magazine. Catalogs serve as a key communication vehicle that can drive consumers online or to a retail outlet to make a purchase. 54% of Millennials look forward to receiving retail catalogs in the mail. Of the Millennials that rely on catalogs to help guide their purchases, half visited a retail website and 38% visited a physical store location. Millennials are cost-conscious consumers—many were challenged by the 2008 recession, face a competitive job market, and are still paying off their student loans. As a result, it comes as no surprise that 72% of Millennials use retail inserts to compare prices at grocery stores and obtain coupons. Millennials like magazines. Although they do pick up some of their news from the Internet and broadcast media, Millennials are more likely than the overall U.S. adult population to read printed magazines related to food/nutrition, fashion/beauty, celebrity/entertainment, and health/fitness. Furthermore, 62% of Millennials reported that they preferred reading printed magazines. Although Millennials use electronic media more than older generations, they are not ignoring print. The Quad/Graphics study highlights that in a world that is oversaturated with e-mail and social media, print remains effective among Millennials. As service providers work with their clients, they must ensure that their printed communications are relevant to Millennials. Millennial consumers are seeking interactive mail pieces that drive them to digital channels, and they will expect consistent messaging as they navigate across various channels. Marketing to Millennials isn’t an option but a necessity—these consumers possess a huge amount of purchasing power. Even in today’s “all channels on” environment, print continues to cut through the clutter. Service providers must work with marketers to develop fully integrated marketing plans that make use of newer mediums like social and mobile without overlooking the importance of more traditional printed assets. © 2019 XpressEnvelopes.com. All Rights Reserved. Website hosting by Shopify.